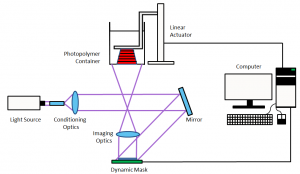 This machine uses a broad spectrum light source to cure photopolymers by projecting 2D images using a Digital Micromirror Device. This machine was developed by students in the lab; and unlike commercially available machines, the hardware and operating software of this process can be completely customized for more specialized applications. The constrained surface design cures photopolymer layers between a glass plate and the previous layers. The newest layer is peeled from the glass, which is coated in oxygen inhibiting PTFE Teflon to reduce adhesion. This allows for an economically advantageous process that requires less photopolymer and has a vertical build rate greater than other projection stereolithography systems. The peeling process performed in the constrained surface technique, however, limits the achievable minimum feature size. Materials: Poly(propylene glycol) diacrylate (PPGDA), Poly(ethylene glycol) diacrylate (PEGDA), Poly(ethylene glycol) dimethyacrylate (PEGDMA), diacrylate functionalized Pluronic L-31, Pluronic L61, Pluronic L81, Pluronic L-121, Pluronic 10-RS, and many other diacrylate or dimethyacrylate functionalized polymers. MPμSL is an Additive Manufacturing process that uses DLP technology to digitally pattern UV light and selectively cure entire layers of photopolymer resin and fabricate three-dimensional parts. This custom machine uses a UV light source (365 nm) to cure photopolymers layer by layer. As opposed to Constrained Surface Stereolithography machines, this machine projects from the top which results in somewhat higher resolution on the order of tens of microns. MPµSL is an excellent solution for building small parts with extremely high resolution and thus this technology is well suited for fabricating tissue scaffolds. This machine is also being used to characterize novel polymers that are being synthesized in a collaboration with Timothy Long‘s lab in the Department of Chemistry. Materials: Poly(ethylene glycol) diacrylate (PEGDA), Poly(ethylene glycol) dimethyacrylate (PEGDMA), other diacrylate or dimethyacrylate functionalized polymers and ceramic suspensions. 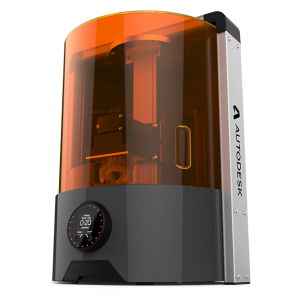 The Autodesk Ember is a bottom-up MPμSL system that uses DLP technology to digitally pattern UV light and selectively cure entire layers of photopolymer resin and fabricate three-dimensional parts. This commercialized machine is open sourced which enables the user to control printing parameters, customize its firmware, and print from third-party resins. This printer uses a UV light source (405 nm) that is digitally patterned from an array of mirrors spaced 7.6 microns apart on the digital micromirror device to selectively cure photopolymers layer by layer at the micron scale. This machine projects from the bottom which enables a larger build volume but at a small expense of resolution compared to top-down MPμSL systems. The design of the Autodesk Ember is also completely open source, with CAD files of each component available online to encourage machine modification and its electronic components for exploring print constraints. This machine is currently being used to fabricate ceramic structures in our lab and novel polymers synthesized in a collaboration with Timothy Long‘s lab in the Department of Chemistry.